It's an extremely safe appliance thanks to the patent-pending Safer Plug fire prevention technology. The safety plug prevents overheating and potentially dangerous fire. The power cord is rather short. 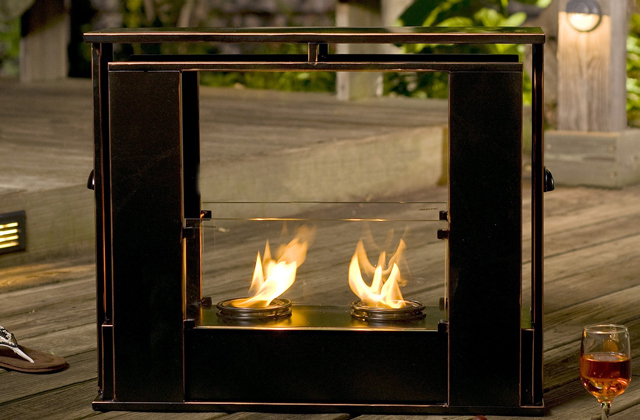 The Duraflame Quartz heater is designed to assist the heating system you already have. It's a very efficient and safe appliance that has a classy look. Rooms up to 1,000 sq.ft. It uses an advanced heating system that can produce 60% more heat compared to other 1500-watt heaters. So, it uses much less energy yet delivers great results. To use the remote, you should press the POWER button on the heater first. This is a very reasonably-priced product that works exceptionally well. It offers greater heat production, using much less power than competing heaters. With Lifesmart portable infrared heater, you will breathe only clean and filtered air, and the heat will be spread around the room. It also features an Eco Setting for smaller premises. The heater may seem a bit noisy because of the fan hidden inside. 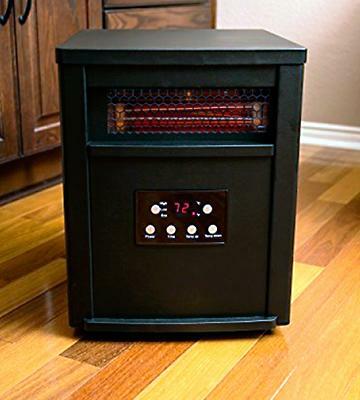 Based on quartz heating elements, this heater can heat the area of up to 1500 ft. The performance here is top-notch, there are several modes, yet the control is really simple. Rooms up to 1,500 sq.ft. 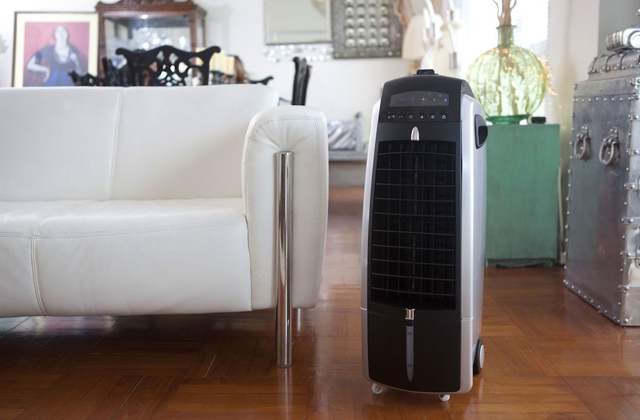 The High mode requires 1500 Watts of power and can warm up your room almost instantly. Working in this mode, the heater will blow warm air just within 5 seconds after turning on. The unit might emit a specific smell at first. 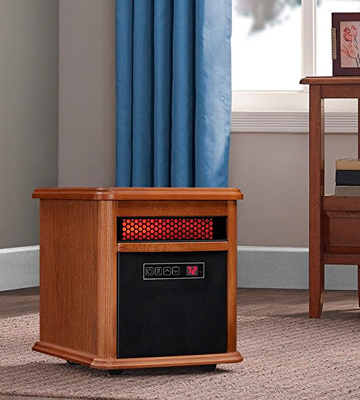 The Air Choice heater will help you quickly make any medium-sized room toasty warm. 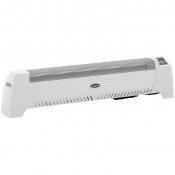 The heater has a quartz heating element which makes it energy efficient and quiet. Rooms up to 215 sq.ft. Thanks to oscillation function, the warmth is distributed more evenly and faster throughout your room. Built-in humidifier produces a cool mist to add humidity to the air. The fan noise is noticeable when on High setting. 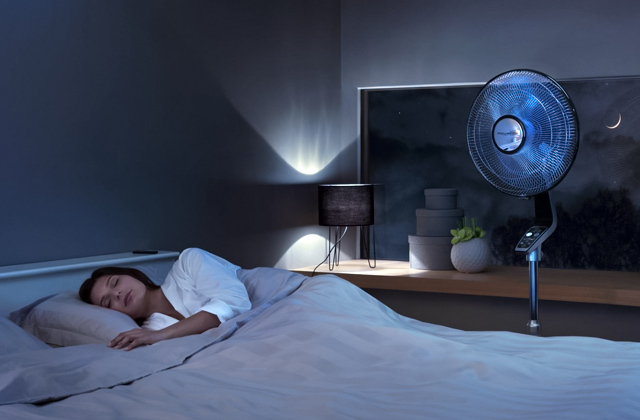 If you need an all-in-one unit for warming and humidifying the air in your room in winters and cooling it during hot summers, the Dr Infrared DR998 is your choice. The Duraflame 9HM9126-O142 is a good portable heater that can deliver supplemental heat for spaces up to 1,000 sq. ft. It's nice-looking, fairly quiet, compact and puts out quite a lot of heat for its size. 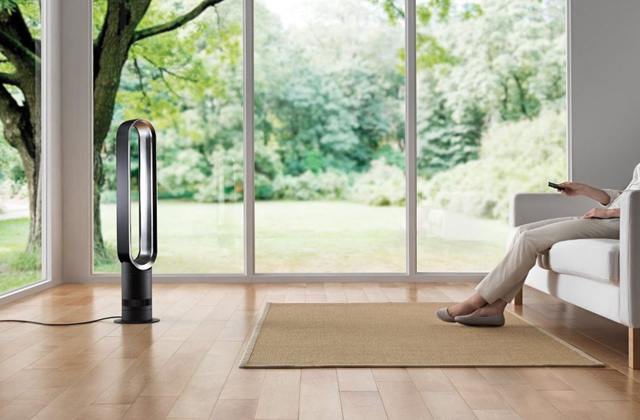 Equipped with six infrared quartz tubes, the unit ensures 5,200 BTU output. The heat is warm, balanced, and soft. If used in conjunction with a furnace or central heating system, the unit can warm up even a very large room in about 20 minutes. Once the heater reaches your set temperature level, it'll go a few degrees higher and go into a Cool-down mode to purge itself. The heat range is between 50 and 97 degrees F. You can adjust it to read Celsius as well. If you want to see the ambient room temperature, you should always have the power button on. Also, there's a timer button on the control panel. Thus, you can set the timer to cut off the heater in increments from 30 minutes up to full 9 hours. The remote control also allows you to program for how long you want the heater to operate as well as select the desired temperature. Surprisingly, the Duracell batteries for the remote are already included in the package. The heater comes fully-assembled (even with the castors attached). You just need to pull the unit out of the box and plug it in. 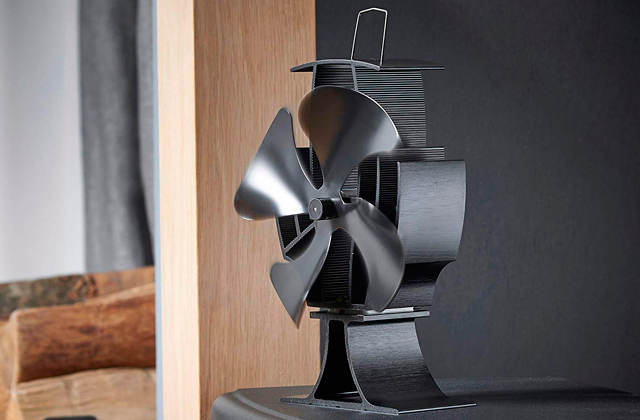 Framed in high-quality hardwood and wood veneers, the heater is very nice to look at. It doesn't feel cheap or flimsy and looks like a nice piece of furniture. 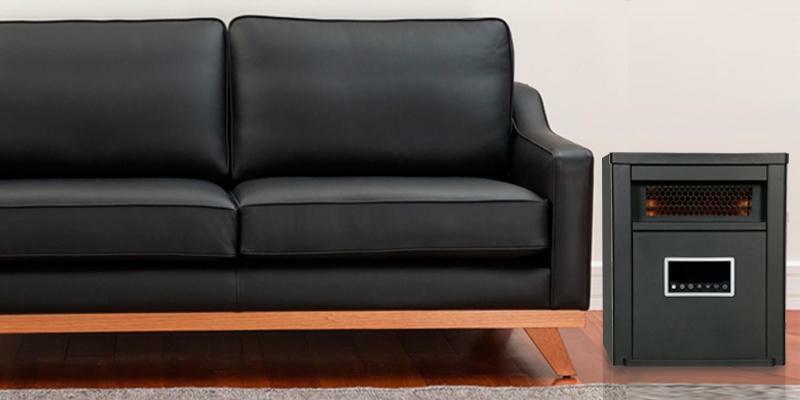 It's offered in Light Oak and Cherry finishes to suit your interior best. The wooden parts of the unit remain cool to the touch. The only slight drawback of this model is its rather short 6-foot power cord. Overall, the heater is well-constructed and feels substantial. And it has an amazing 3-year factory warranty. We would definitely recommend this heater to those looking for a supplemental heat source. The heater boasts Patent-pending Safer Plug fire prevention technology that can monitor the plug temperature owing to the built-in thermometer. If the plug temperature rises higher than safe levels, the plug will automatically shut off right away, thus preventing overheating or even fire. The Dr Infrared heater is proudly produced in the USA. It boasts high energy-efficiency class, great heating capabilities, safe design, and quiet operation. 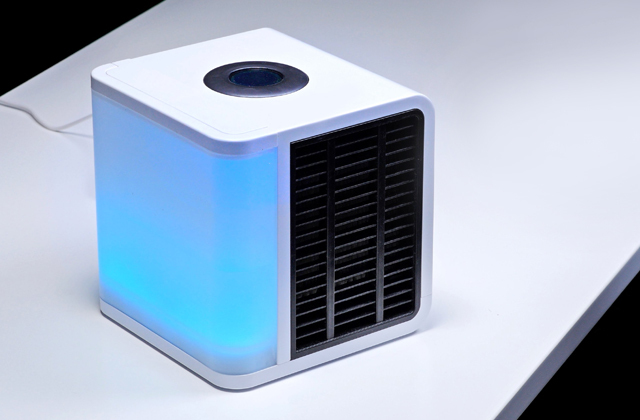 It uses infrared heat that warms objects in your room like sunlight without stripping your room of moisture. Thus, you won't experience dry skin or parched throats like it often happens with convection heaters. It can work all night long keeping your bedroom comfortably warm and your sleep sound. 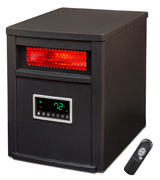 The infrared heater has three settings - Auto, Low (1000W) and High (1500W). The Auto mode lets you set the target temperature somewhere between 50 and 86 degrees F. Then, it automatically selects between Low and High settings depending on the ambient temperature in your room. Once the heater reaches your desired temperature, it will blow out the remaining heat on Low setting for a couple of minutes. Of course, you can manually set the item to run on Low or High modes. Stuffed with a dual heating system and high-velocity blower, the heater can make large rooms toasty warm very quickly when running on the highest setting. The heater works amazingly well and quietly. It never gets hot to the touch, which is an obvious advantage for families with small kids. 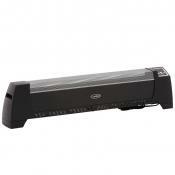 In addition, it has a tip-over protection and auto shut-off overheat function. So, you can sleep soundly with this heater on all night long. The item has a timer, however, it doesn't allow you to program the unit to turn on at a needed time. You can only set it to turn off after a certain amount of time. 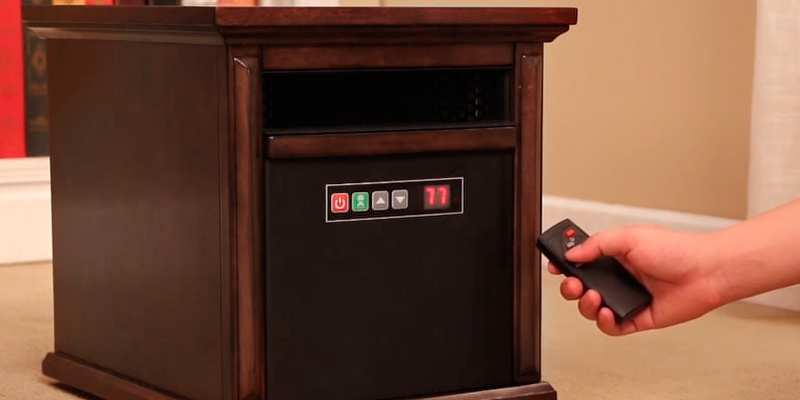 The heater comes with IR remote control that can work from all the way across large rooms. Being 24 lbs, this portable space warmer is not very heavy, yet it's equipped with caster wheels for effortless transportation. Plus, they make it easier to turn the heater for changing the direction of the airflow. The unit doesn't take up much space and blends nicely into a classic home décor. It's powerful enough to keep your bedroom or living room warm even without a need to switch the heating on. 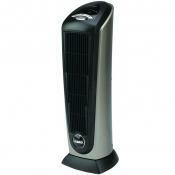 The best part about this Dr Heater is that it can produce 60% more heat compared to other 1500-watt heaters. 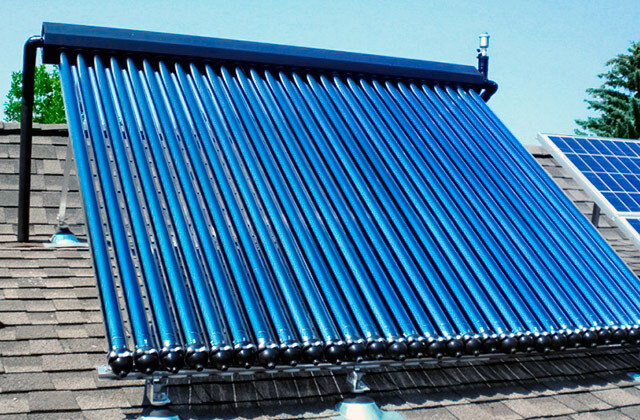 It uses an advanced heating system which ensures amazing heat production. 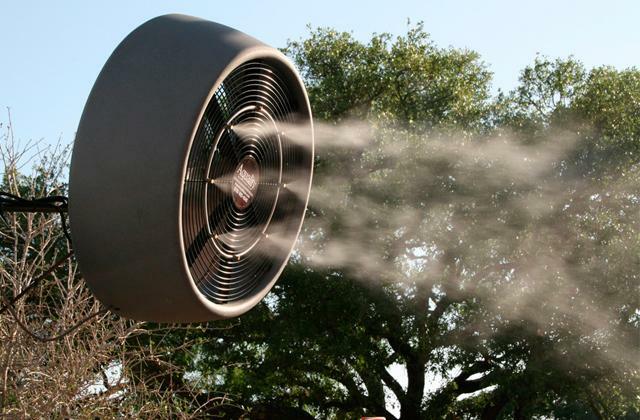 Its high-efficiency blower delivers about 250 degrees F at 3.5 m/s, while its rivals can do only 155 degrees F at 2.2 m/s. 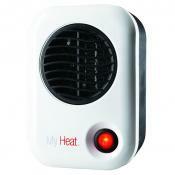 It heats rooms swiftly and efficiently with no hot or cold spots. 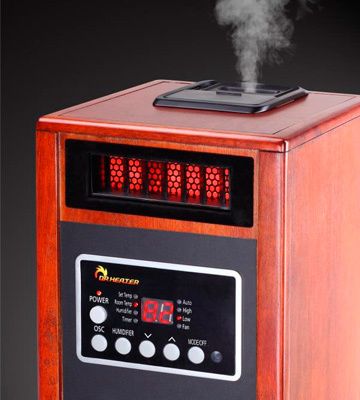 With this Dr Infrared Heater Portable Space Heater, you can really consume less electricity, and get more heat! The issue of safety always arose among engineers and consumers alike. More so when heating devices are in question. This is why Lifesmart specialists did their best, taking safety features into account when they designed this infrared quartz heater. The heater itself looks like a cabinet with wheels, it is really easy to move it from one room to the other. And the safety is as follows. First, we feel obligated to mention a special protection — the heater will turn off automatically in case of overheating or tipping over. And combined with the fact that the outer body does not heat up, we'd say this is an extremely safe model. Lifesmart is known for thinking of its customers' safety, making it possible for us to recommend this infrared heater for installation in your home. 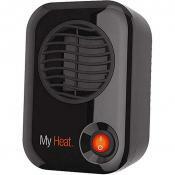 So, it's very safe and very powerful small heater that can quickly warm up large areas up to 1,500 sq.ft. 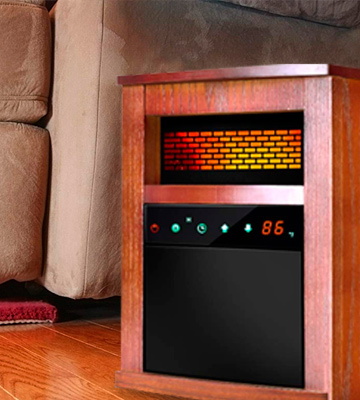 The Air Choice space heater can provide you with a toasty warm atmosphere in your home no matter the weather outdoors. It offers you three heating modes so that you could find the best option for your place. 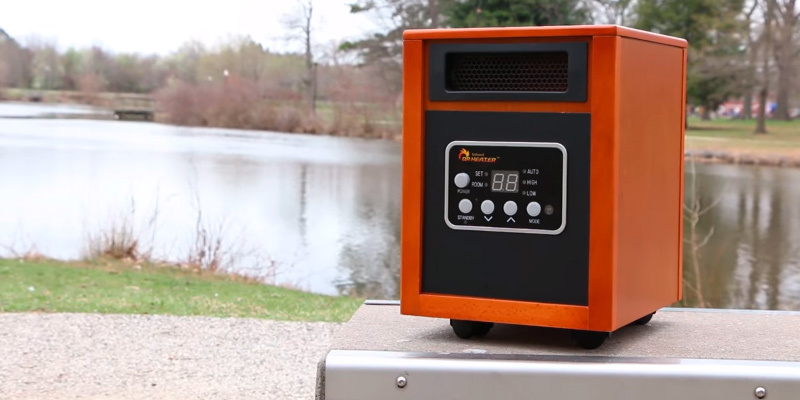 The High mode requires 1500 Watts of power and can warm up your room almost instantly. Working in this mode, the heater will blow warm air just within 5 seconds after turning on. Running on the Low mode (750 Watt), the heater can maintain a comfortable temperature, and on the Eco mode, it is being cyclically on/off to keep your place warm in the most energy-efficient way. Thanks to the thermostat function, you can set any temperature between 59°-86°F. You have the option to program the thermostat either by touch controls on the screen or remote. So, you can take benefit from the thermostat and forget about constant walks to turn on/off the heater. The Air Choice warmer offers a very convenient and effective way to overcome the cold weather this winter. And not only this, of course. The unit is very durable and can serve you for long years to come. 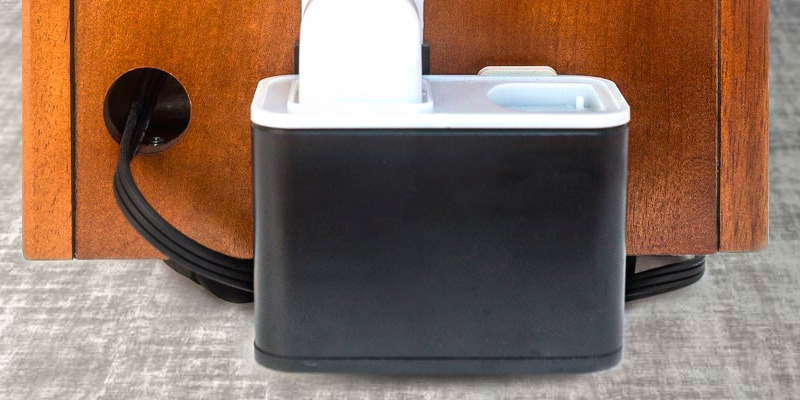 For safe storage, the unit is thoughtfully fitted with a cord clamp on the back so that the power cord could be neatly wrapped around. Made with safety in mind, this electric infrared heater has a tip-over shut-off protection that automatically turns off the unit when it's kicked down accidentally. Also, it's featured with the overheat shut-off function - if the heater reaches the potentially dangerous temperature about 105°F, it powers down to prevent fire. Yet, the heater is not only extremely safe but also very convenient to operate. It comes with a handy remote that allows you to select any settings while watching TV on your comfy couch. As a safety touch, the remote panel can be locked wherever you need it, which is especially useful for families with small children. The working status can be monitored on a LED display screen on the front of the wooden cabinet. The last but not the least thing to mention is that the heater carries a smart timer that can be set from 0 to 12 hours. The timer can be adjusted not only to "shut off" the unit but also to "turn it on" so that you can come at a toasty warm home every day! So, if usability, safety, and convenience are the things you value, the Air Choice Electric Space Heater might be a sensible purchase for you. 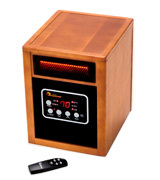 The Dr Infrared Heater DR998 is the #1 selling Amazon heater. 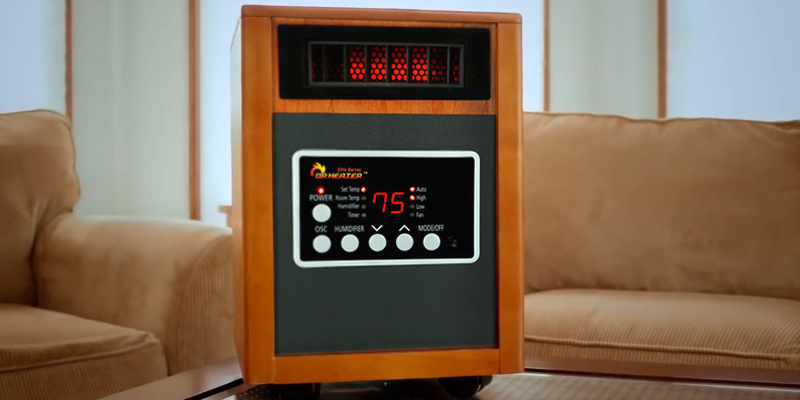 It's the world’s first 4-in-one infrared heater that deftly combines air purifier, oscillating fan, humidifier, and a space heater. And each of these functions can be controlled independently. 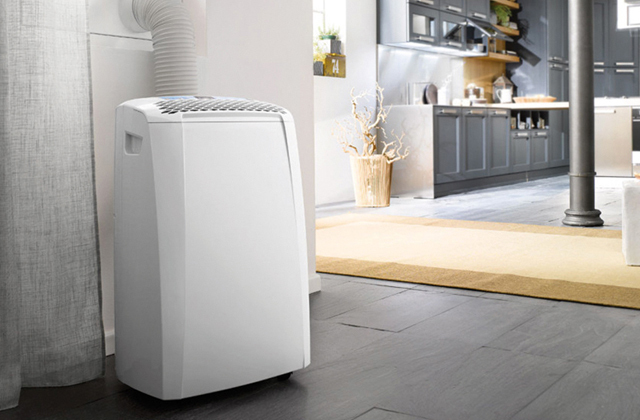 The built-in filter removes microparticles of dust, pollen, and other allergens from the air in your home, while a humidifier can produce a cool mist to add a little moisture to the air, which is especially useful during winters when the air tends to be too dry. No more sore throat, dry sinuses, or cracking skin. And since the humidifier is ultrasonic, it's silent and extremely energy-efficient. 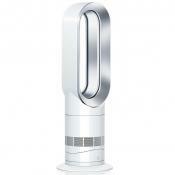 However, the best part is that the item has an oscillation fan, making this model an all-year-round option. 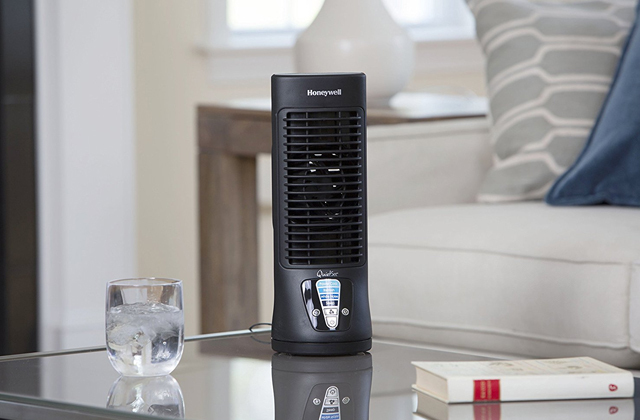 It can operate together with a humidifier or in a fan-only mode. Boasting dual heating system (Quartz tube + PTC), the heater is suitable for spaces up to 1,000 sq.ft. You can select the temperature from 50 to 86 degrees F and choose Auto, High, or Low power setting. If needed, you can set the timer to turn off the heater or humidifier at the specific time within the 1-12 hours. Thanks to oscillation function, the warmth will be distributed much faster and more evenly throughout your room. 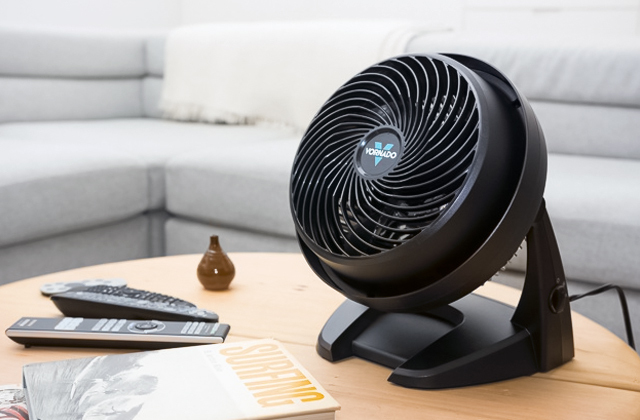 However, note that the fan can be a bit noisy, running on the highest setting. All in all, if you need a multifunctional appliance that can not only keep your room warm and sufficiently humid in winter but also make the air comfortably cool and purified in summer, the Dr Infrared Quartz heater DR998 is your choice. 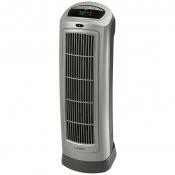 "Oscillating" usually means that that the whole unit is rotatable, but not with the Dr Infrared Heater DR998. 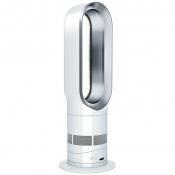 It simply has the inner oscillating slots that swivel back and forth, allowing the heat to come out. The unit distributes the heat evenly. This smart design makes it much more energy efficient. The humidifier works decently as well. It can produce a powerful jet of cool mist that goes about a foot above the top. You can adjust the mist a little, using a small sliding door. In addition, this door can protect the unit from dust coming inside when it's off. The water reservoir and the bottle are illuminated by blue light, which is a nice touch. The whole product is reasonably light and portable. For easy glide on flat surfaces, it's fitted with caster wheels. 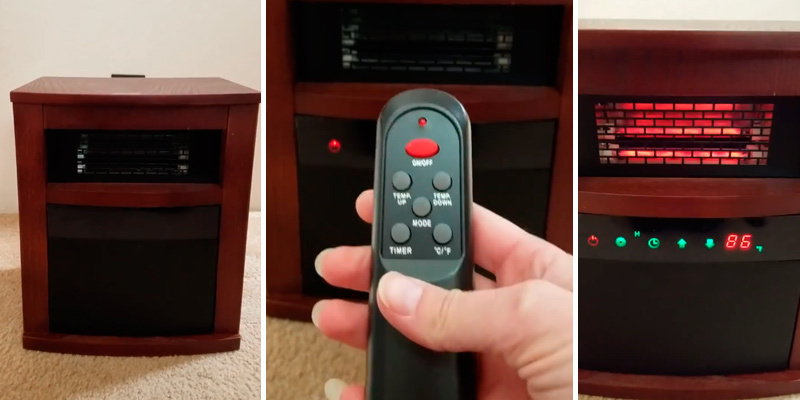 The overall design is good - the power cord is long enough to let you use the heater in any corner of your room, the remote controller works nice, and the toggle buttons are very responsive. The unit has a lifetime filter that can be easily removed and cleaned. As for the safety features, the unit has a cool-to-the-touch body, overheat protection, and tip-over protection. Nowadays, infrared heaters face a high demand, and they have become the devices affordable for everyone. 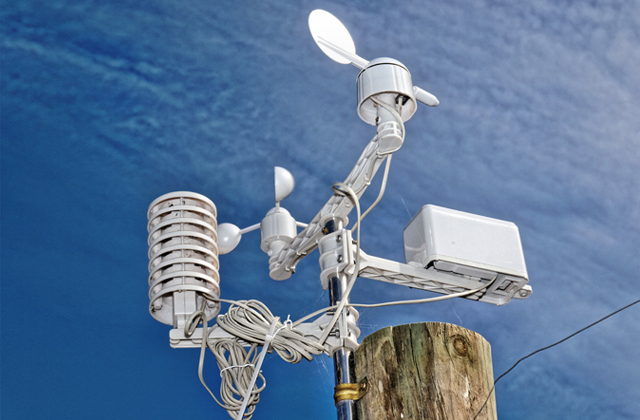 These devices differ from well-known convectors greatly. Infrared heaters transmit the heat not to the air, but directly to objects, by showering them with infrared rays. You can call an infrared space heater a small room-sized sun. The sun rays penetrate the air without heating it, and only when they meet the objects that do not permit light through, they get absorbed, thus heating the object. The infrared room heaters work the same way. When you buy a device, you obviously wish it worked for years and did not break down. 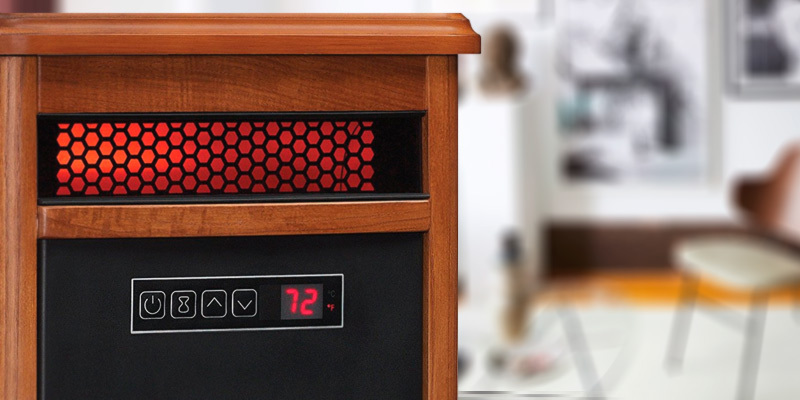 In our infrared heater review, we will help you discover the ways to choose an infrared heater based on its design features. For this reason, we will look in detail at how the infrared space heaters work and define the main criteria that should be taken into consideration before purchasing one. Here, you'll find both small and big models for home use. There are a lot of other devices besides electric infrared heaters that can be used to warm up the living space. One of them is a space heater about which you can read in this review. This review will delve into a number of factors you should consider before buying an infrared heater. 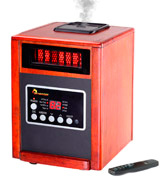 First, you have to pay attention to the home infrared heater's Heating Level and Design. You should decide whether you need a stationary or a portable infrared heater. Portable electric infrared heaters are smaller in size and have lower power, and stationary infrared heaters can be either wall- or ceiling-mounted. The area heated by the infrared space heater depends on its power. A 100 sq ft room usually needs an infrared heater of 1 kW (1000 W) power. But we suggest that you buy a heater with some backup power storage. It is especially recommended if the infrared space heater is your only heating source, as you have to consider heat leakage through the walls, windows, and flooring. However, when the electric infrared heater is just an additional device for your existing heating system, then you should probably calculate the power based on the operation conditions your infrared heater will be working at. 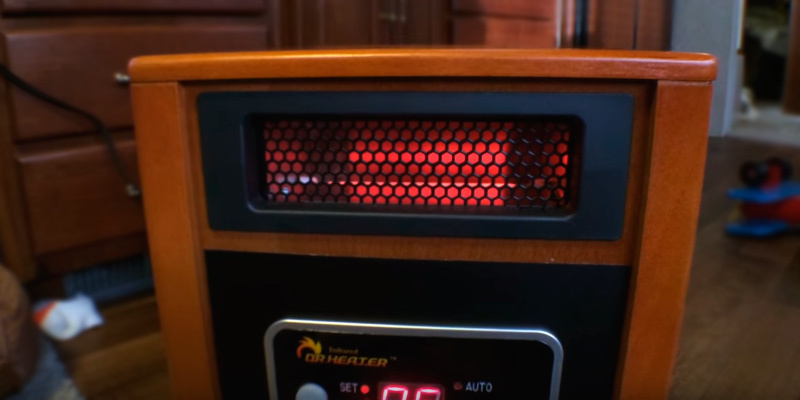 When you have in mind all the information on features, you will have an idea about where and how you can use the infrared space heater, and whether it corresponds to your needs. The second important factor to think about is, of course, Functionality. 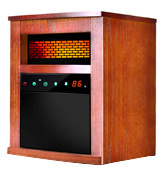 You consider it regardless of what device you are looking for, the electric infrared heater included. Usually, we attribute the infrared heater's control, operation modes, and additional features (like timer or thermostat to maintain a constant temperature) to its functionality. And, finally, pay attention to the infrared space heater's Reliability and Safety. An electric infrared heater is a type of device that should not have adverse effects on your health and should be safe to use. 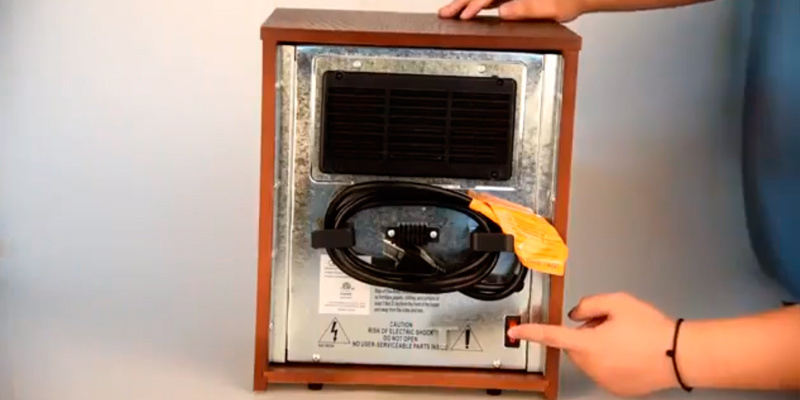 To see if the infrared heater is safe for you to use, look at the type of its heating element. There are four types — halogen, carbon, ceramic, and micathermic. Each type has its own advantages. A halogen heating element is basically a halogen lamp that emits light in an infrared spectrum. Its main downside is that halogen heating element emits short waves, and they can be harmful to a human health. A carbon heating element is shaped as a quartz tube with a vacuum and carbon spiral inside. The strong points of these infrared heaters are fast heating and a higher efficiency coefficient to the heated metal plates. But, there are also bad sides. The life span of such heating elements is approximately two years, and they need quite a lot of energy — 1 to 2.5 kW. They emit reddish light, capable of irritating the eyes. Also, this type of electric infrared heaters is not recommended to people with allergies and asthma. A heating element with a ceramic coating is well-protected, so it does not emit light during operation. And they work for three years at least. A tube (micathermic) heating element reminds the ceramic one but is made of metal. Note that when you use an infrared tube heater you will probably hear a crackling sound. The reason for this is that the coefficients of temperature expansion for the steel spiral and the aluminum housing are different. As for the safety of use, any electric infrared heater must have the means to minimize the possibility of fire. Such means might be in the form of overheating indicators for any type of the infrared heater and/or the tip-over protection for portable models. While conventional models heat the air directly, infrared heaters use a different technology. The gist of infrared heaters is that they produce light! Really, the heat they emit is just a product of light that is completely invisible to our eyes. And the reason why we get warm is that our skin, as well as our garments, absorbs this infrared light. The same goes for the furniture and other objects in your room. It’s like being in the direct sunlight vs staying in the shade. However, you can find several types of infrared heaters today. Some of them direct the infrared light straight onto objects, while others create heat. The latter models contain three parts - infrared light bulb (or a couple of them), a heat exchanger, and a fan. The biggest edge over gas heaters is that infrared heaters don’t overdry the air in your room, providing a healthy environment to live in. As a result, you feel not only pleasantly warm but energetic as well. Another obvious advantage you might not be aware of is that infrared heaters can even help improve your blood circulation, strengthen your cardiovascular system, and boost your immune system. Really! Doctors in some countries already use infrared panels to treat heart diseases. The thing is, infrared heat penetrates deeper than regular heat, thus pushing blood vessels to expand and making more blood to pump through them. Also, infrared warmers can make the objects in your room to retain heat. They stay dry and the mold can’t grow consequently. Less mold, fewer allergy triggers. So, infrared heaters can even double as dehumidifiers to keep objects, walls, and ceilings warm and dry. And since infrared heat doesn’t stir up the air, there is no dust circulation across your room. A win-win choice for those suffering from asthma or allergy. 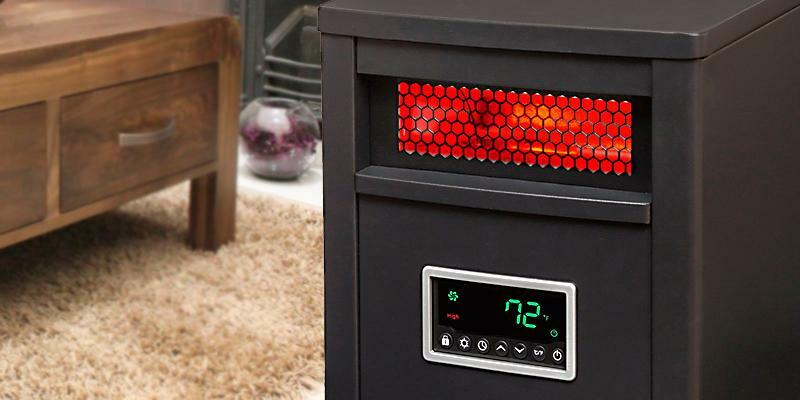 Infrared Heater vs Oil Heater. Which is faster? 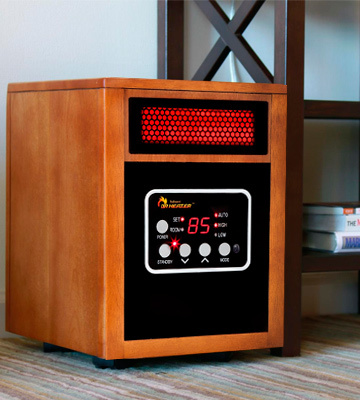 If you wonder what heat source can warm up your room as fast as possible, the answer is “an infrared heater”. Since they usually heat objects in a room directly, it takes the infrared heaters less than a minute to make them warm. However, if we’re speaking about the infrared units that heat the air, everything depends on the room you’re going to warm up. Naturally, it takes longer to hit up larger spaces. But again, in less than a minute, infrared heaters can produce warmth. This makes them a much faster solution compared to oil heaters. 1. How to Buy an Infrared Heater, wikiHow. 2. Infrared Heaters: Pros and Cons, air & water. 3. 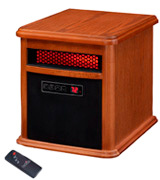 Anna B. Smith How do I Choose the Best Infrared Space Heater? wiseGEEK. July 05, 2016.